CGTN’s Oliver Jarvis investigated the underreported practice of child trafficking in Kenya – speaking to those who had been most affected, and those who were fighting the practice on a new front. To many, this would be a typical childhood nightmare. But this, was a Kenyan girl’s reality. Not only was she forced by her father to undergo female genital mutilation, she was also routinely beaten by his wives. At 12-years-old she ran away from home, but her father tracked her down. He wanted her to get married. The story of how she was trafficked thereafter has never been told fully to camera – a memory too painful to tell. If it wasn’t for her cousin who rescued her and took her to the country’s capital, Nairobi. She may never have been found by anti-trafficking organisations. NGOs estimate that there are thousands of stories just like this one. But there is no accurate figure for the number of children trafficked in Africa. Organisations have to rely on their own statistics to try and gauge an idea of how widespread the problem is. Often, survivor stories help them to build up a picture. “Men were coming in, mostly white men and Arabs. They could come in any time, they could pick anybody they wanted. They used you, you had to do whatever they told you to do – you had no choice,” another survivor in Kenya, told Awareness Against Human Trafficking (Kenya) – or HAART. 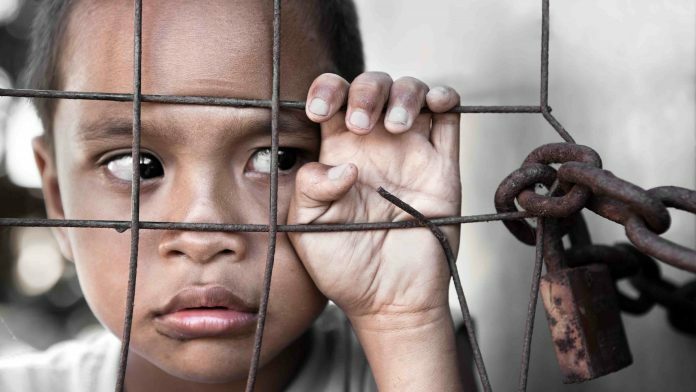 The International Organisation for Migration lists Kenya as a child trafficking hub. Those who are bought and sold in the country are often pushed into forced labour. Children fall into street-vending and begging groups. Girls and boys are also exploited into prostitution. Across the African region, children have also been known to become child soldiers – and even to be trafficked specifically for organ removal. Authorities are struggling to keep up with the scale of the problem. But, through talking to organisations involved in trying to help those affected, and end the practice – you realise just how intertwined and extensive the African child trafficking web is. Activist groups are forging a new path to fight traffickers. Through education, a Kenyan-based NGO is reaching out to those most vulnerable. With the release of a number of materials and lesson plans, HAART Kenya are appearing in classrooms and children’s homes across the country to help raise an awareness on the issue. “As HAART Kenya we were able to come up with a manual. Which also has different materials being used. Together with the manual we have video clips, we have songs that we’re using, and different placards. The usefulness for these materials, is that it becomes more child friendly and it makes it easier to discuss issues with children on a level that they understand,” Winnie Mutevu, Youth Coordinator of the initiative told CGTN. Their aim is to teach children the dangers of human trafficking. Although the project has seen more children becoming aware of the issue – HAART Kenya has faced a number of challenges. Winnie herself, has seen her lessons shut down by people she believes are involved in the trafficking network – it has pushed her to employ security protection for her work in certain areas across the country. Clearly, those who are involved within it, do not want children to become aware of the dangers. But the interactive lessons are garnering a largely positive response from institutions in Kenya – and from those who take part in the sessions. “I like this lesson because it teaches us how we can educate people on human rights, and how to help other children like us so that they can learn that child labour is a bad thing to do,” Leon Otieno, an 11-year-old student told CGTN. His friend, a 9-year-old called Kyron, spoke of how he enjoyed learning from the materials and how he wished to tell other children in his community about it. HAART still believe that authorities should be doing more to take on the traffickers. They aim to have authorities work hand-in-hand with independent anti-trafficking organisations so that they can establish a solid platform to fight the trafficking network. Through communities becoming more aware of trafficking, and the signs of it – they may have a chance at alerting officials before it is too late. The NGO estimates at best just 2% of Kenyan children who are trafficked ever make it home.